« Who is your audience? At least there was much to admire in the presentation of the pack, polished in the sunlight and somewhat dazzled by all the people. The early morning sun turned the pack into Apollo’s hounds: golden light and golden/red hounds. 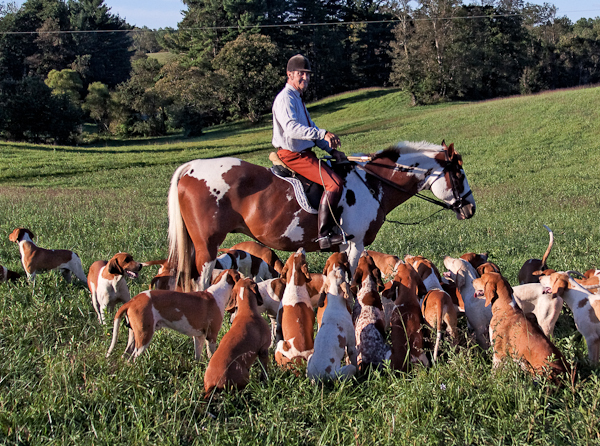 The colors of the Old Dominion Hounds include brick-colored breeches. 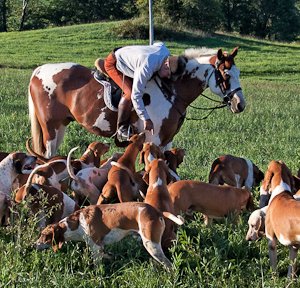 Combined with the red ring-neck hounds and the huntsman’s vividly colored horse, it creates an amazingly harmonious color scene. 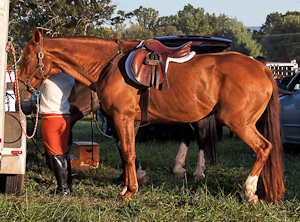 I understand breeding hounds for a consistent color, but just how did they get that horse to match? 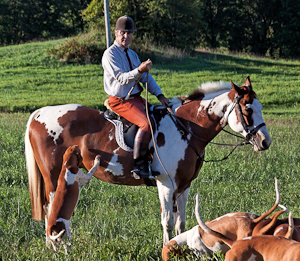 When far from the action, or absent any action at all, one natural response is to turn to landscapes, especially since hunting often takes place in lovely surroundings. 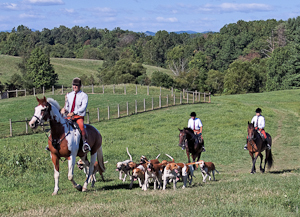 The Old Dominion Hounds territory is in the Virginia Piedmont country, around the Rappahannock River. The Blue Ridge Mountain dominates the western skyline, and closer outlier hills on either side of the river provide contrast. It can be a challenge to make the vista that seems so impressive in person interesting as a photograph, absent special equipment and elaborate post-processing. One approach is to make lemonade out of your lemons: if the subjects are too far away to be interesting in their own right, use them to give some scale to the overall landscape. Then the folds of land and the haze in the atmosphere are pluses rather than minuses. Don’t forget to boost the contrast enough to get some visible detail for the distant mountain. 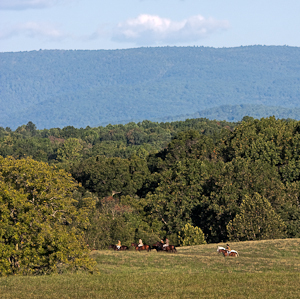 In-between the near hills and the Blue Ridge Mountain in this photo lies the Rappahannock River. Another technique is to highlight the landscape more indirectly, as background to your subject. This conveys a sense of place without losing interest as just a static shot. Photographically, the big technical challenge was the blazing early morning sunlight. There are some obvious responses to that situation. First, go stand with your back to the light — not so easy when all the action faces the other way. Don’t forget to keep your shadow, very long when the sun is low, from being visible in the middle of the shot. Second, watch out for harsh black shadows right next to brightly lit items. Some of this can be mitigated in post-processing by using a fill-light option, or on the scene with a flash, though it always seems so odd to use a flash in brilliant sunlight (folks look at you strangely). On the other hand, the light can also be your friend, when everything lines up well. It can make colors blaze, or create theatrical lighting effects. Bright light creates some other problems with your camera settings. If you’re not familiar with camera settings, there will be more articles later going into greater depth. Four things control how much light creates the shot. The speed of the shutter. The faster it is, the less light hits the receptor, and the more motion can be stopped. The size of the aperture. The more open it is, the more light hits the receptor, and the shallower is the depth of field (area in focus). The sensitivity of the receptor (originally, of the film). The more sensitive it is, the more spurious noise will be created, making the image dirtier. Filters added to the lens. (Not discussed below). To be specific, in an ideal world with perfect lighting I would want a shutter speed = 1/1250, a small aperture < f8 (smaller yields greater depth of field), and a low ISO (less noise). There are, alas, no ideal worlds. 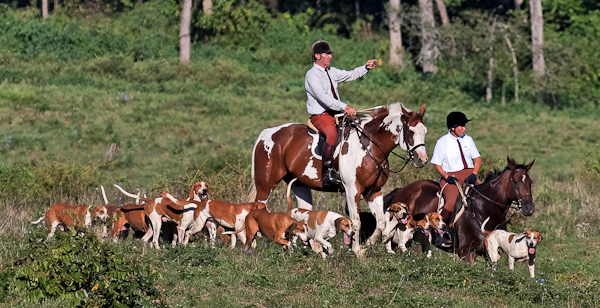 Typically I set the shutter speed to 1/1250 second, which reliably stops the movement of almost all hound and horse tails. (In darker conditions, I’ll step that down all the way to 1/640 if necessary to let more light in, but paws and tails will begin to blur). Then I set the ISO to Automatic and let the aperture default. In a studio, or for a controlled shot, I could have more specific manual settings, but following a hunt, I have all I can do to not knock the shutter speed settings awry. Adjusting a setting while whirling to shoot a fox is just about impossible. For bright light conditions which should be perfect, I found the camera made decisions for the two varying settings that were not what I wanted. There were unpublished photos in this essay that were brilliantly lit, but the camera chose to use a wide open aperture instead of decreasing the ISO number for greater light sensitivity. 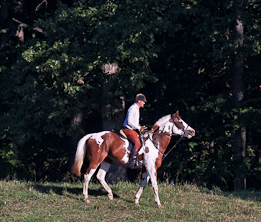 The open aperture created a shallow depth of field, so for a typical picture with two horses together, one behind the other, there was an unpleasant focus problem with the more distant horse. A manual setting could fix that, or an ISO setting of 100 (the most light sensitive) instead of Automatic would encourage a narrower aperture. It’s time for me to move to purely manual settings. This will be an exercise for me in the future, to control the settings more directly when the action gives me sufficient time to prepare. That should result in fewer unsatisfactory shots, as long as I can remember to change the settings back afterward when necessary! 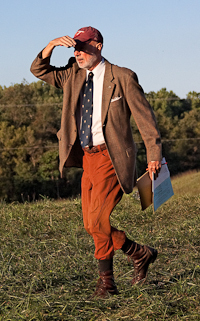 This entry was posted on September 7, 2010, 3:05 pm and is filed under Foxhunts, Landscape, Light, Old Dominion Hounds, Photo Essays, Photography. You can follow any responses to this entry through RSS 2.0. You can leave a response, or trackback from your own site.